There was a time when I thought I was going to be an archaeologist. In fact, I nearly completed a bachelor’s program in anthropology, and I spent several summers working for the BLM and Forest Service conducting archaeological survey and excavation. While I eventually moved away from the social sciences and into mathematics, I still have an abiding interest in archaeology, and often think like an archaeologist. For instance, I am fascinated by material culture—I love the various things that people use in order to carry their daily tasks. I think there is value in learning to use tools that are now obsolete, but which were once vital. In this spirit, I recently picked up an abacus. Of course, now I have to figure out how to use the damn thing. 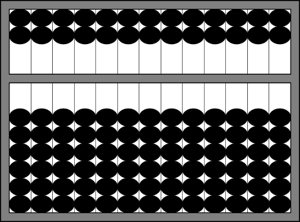 Each wire on the abacus is read in a similar manner. The value of the wire is equal to the sums of the values of the beads on the wire. Beads in the lower deck are worth 1 each, beads in the upper deck are worth 5 each, and only beads that have been pushed against the beam (the divider between the two decks) are counted. Thus any wire in the abacus can be read as a single number, and compared to a Chinese rod numeral, or to a modern Hindu-Arabic numeral. 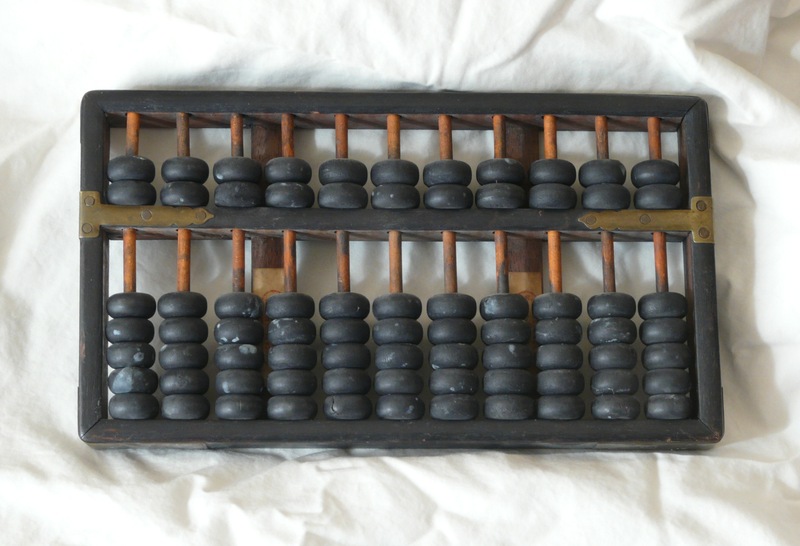 For the rest of this post, we are going to be using an idealized abacus. 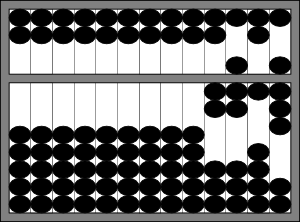 In the image above, the abacus is showing a value of zero. All of the beads in the lower deck are at the bottom of the frame, and all of the beads on the upper deck are at the top of the frame. This abacus has been cleared, and is ready to be used. In the ones place, three beads from the lower deck and one bead from the upper deck have been moved to the beam; in the tens place, one bead from the lower deck has been moved to the beam; and so on. The digits are read from left to right, giving us a value of 2 thousands, 7 hundreds, 1 ten, and 8 ones (the number 2,718). Of course, the power of the abacus does not end with addition and subtraction. There are several methods for multiplication and division, and there are ways to find roots. While the computations are relatively straightforward, they are a bit beyond the scope of this post. However, there are many resources out there for those that are interested. 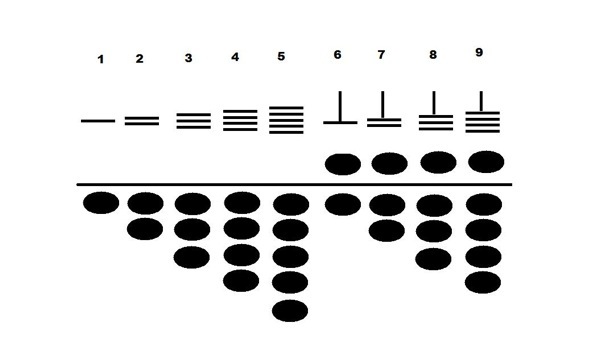 There is a good discussion of multiplication at Abacus: Mystery of the Bead, and Paul Green’s book How to Use a Chinese Abacus: A Step-By-Step Guide to Addition, Subtraction, Multiplication, Division, Roots, and More provides very complete instructions on a number of operations. Other resources can be found in the footnotes, below. This entry was posted in Artifacts and tagged Artifacts. Bookmark the permalink.